The Izium salient has a very mobile but relatively weak head (6th Cavalry Corps, the tip of the Soviet spear) and a particularly strong right shoulder (21st and 23rd Tank Corps). I'm told to "move in for the kill" into the Izium salient, but I have butterflies in the stomach. 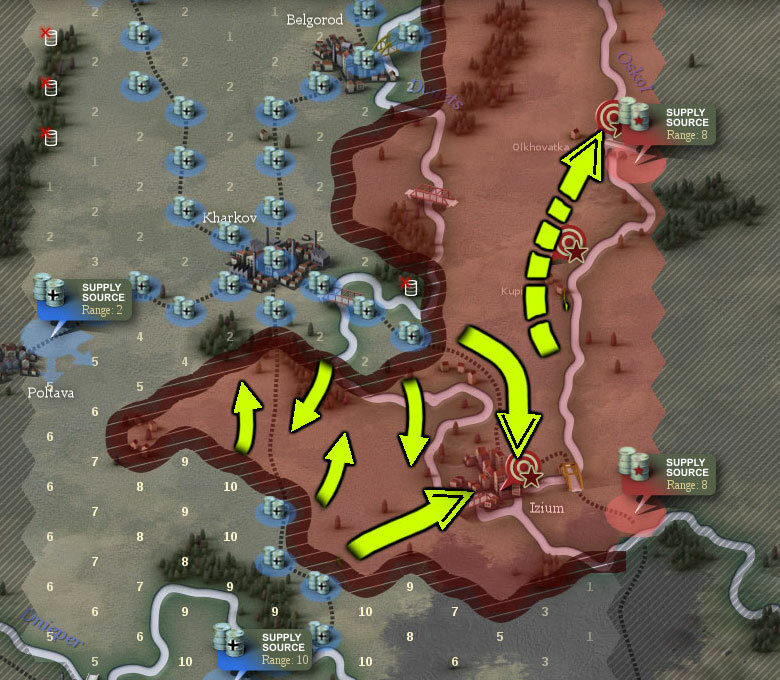 The Soviet offensive prior to the start of this scenario seriously threatens the whole German supply network. The supply sources north and west of Kharkov have a limited range of 2. The supply source south of Kharkov, with a range of 10 is the only source that one can trust with feeding a major offensive. Unfortunately, this south supply source is threatened by the Soviets' advance west of Izium. So, it is imperative to destroy the Soviet forces east of Izium in order to secure the flow of supplies in the entire theater and to launch offensive operations to capture objectives north of the salient. The operations plan is to encircle and destroy enemy forces in the Izium salient by a double pincer movement with all armored/mechanized units available (heavy arrows in the maps above and below) and by supporting/shaping offensive operations with infantry units (light arrows in the maps above and below). Once objective Izium has been secured and enemy forces weakened enough to not pose a threat to our supply sources, resume offensive operations due north (dotted heavy arrow in the maps above and below). Yes fellows, during the first weeks of this operation I'm sinning of lack of aggressive spirit in the front line north of Kharkov. But I need all offensive power on the Soviet salient. I found this article regarding the battle of Rzhev in 41. The topic still seems to emit very strong emotions. There is a scenario in WitE depicting this battle. Hey, if you ever get the time you know what to do..... pbem galore. Played the scenario and, indeed, plenty of surprises. :( I will be wrapping up the AAR soon. Olav! How you doing? It's a lot simpler than WitE, but surprisingly it has legs for what it is. 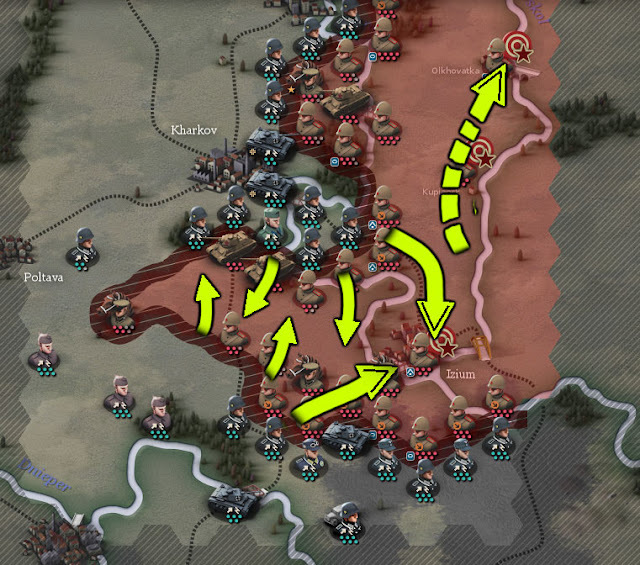 How does this game match up to Panzer Corps? 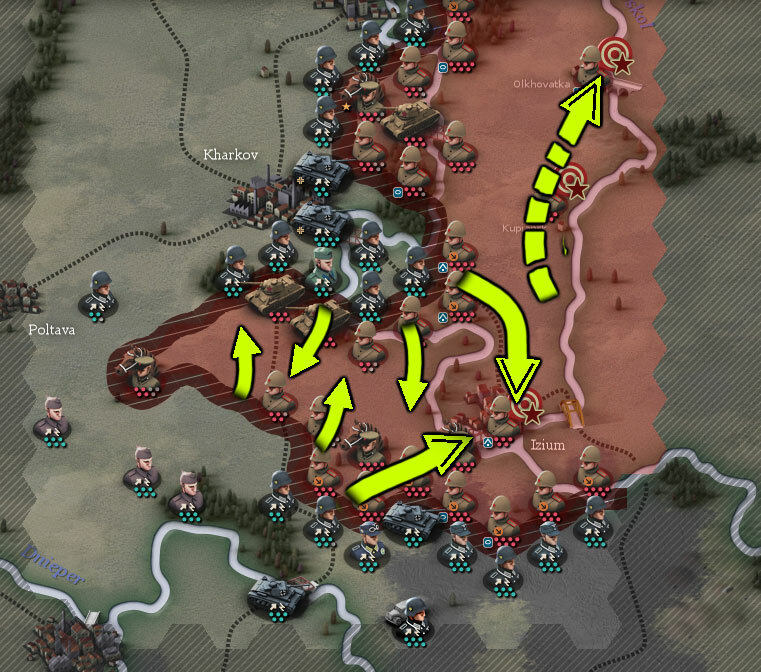 Do the game encompass all of Operation Barbarossa, or just certain battles and campaigns? 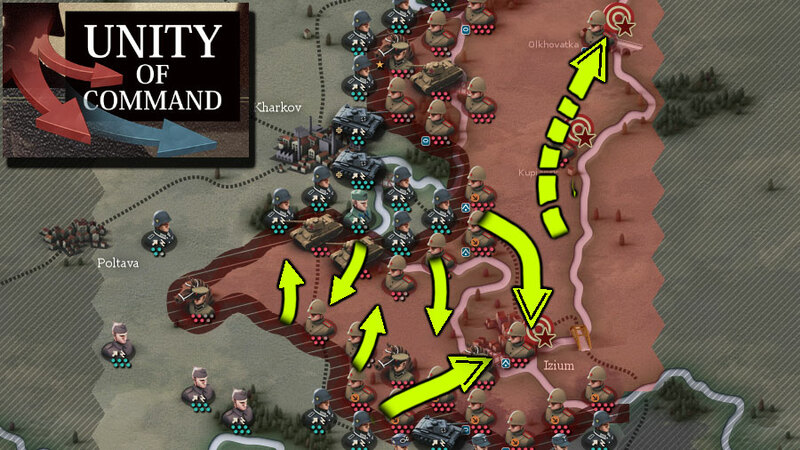 The game encompasses the Case Blue campaign and the Kharkov 3rd battle. Can I ask you what application you have used to draw the plans on the maps?